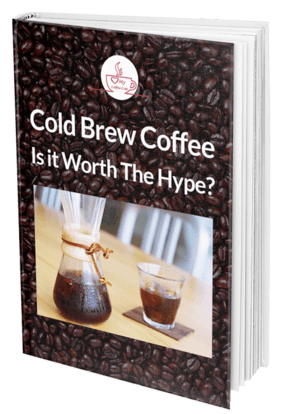 If you like your coffee a certain way, then you must know how frustrating it is not to get your cup of Joe done exactly right. Luckily for all you coffee lovers, there is a range of machines coming out these days with exceptional functionality. 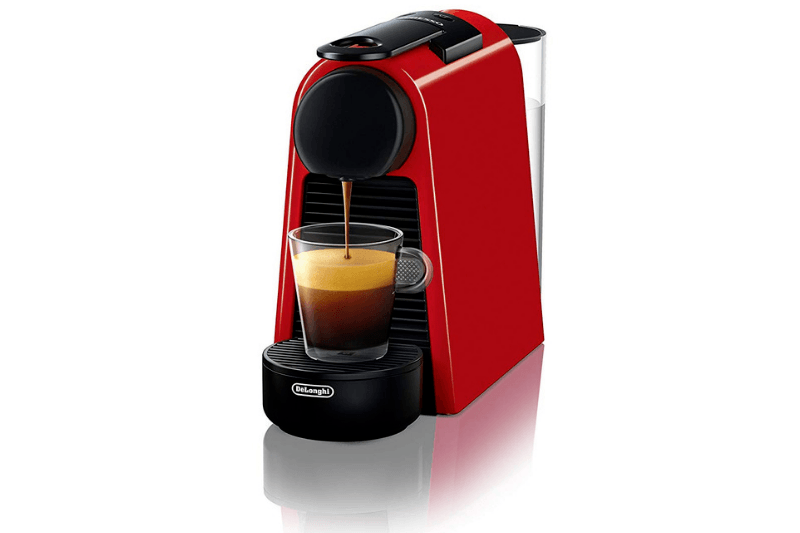 Nespresso is one such company with a range of machines that guarantee a warm cup of coffee for you every morning. 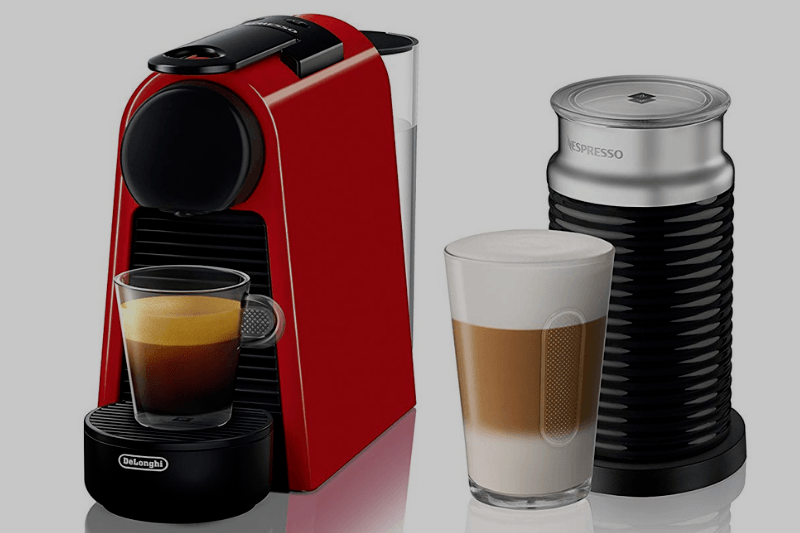 The Nespresso Essenza Mini by De'Longhi is one in a line of products designed to serve the coffee lover at home and at work. This particular unit is the smallest of Nespresso coffee makers. The company teamed up with two different manufactures to give you an espresso maker with varied specifications. 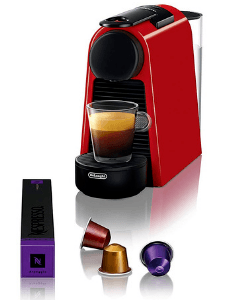 Our aim is to give you a comprehensive review that will tell you all you need to know about the Nespresso Essenza Mini. Our hope is that you can make an informed choice as you get this coffee maker. Upsides and downsides of the product. What others users have to say. Ready for some exciting information on this compact mini espresso maker? Great, let’s dive into the Nespresso Essenza Mini Review! Accessible in two different designs and 3 color choices pictured above. Light and compact design. Dimensions 12.8 (H) x 4.3 (W) x 8.0 (D). Detachable water reservoir with 20.3 oz capacity. Used capsule drawer to hold 6 capsules. 2 programmable capsule sizes; Lungo and Espresso. Energy saving settings turn on after 3 minutes. Automatic power off after 9 minutes. Weighs in at 3.98 pounds. Design & Tech of The Machine: The Nespresso Essenza Mini may be the most compact coffee brewing machine you have ever seen yet it delivers beyond expectations. The model has some smart technologies added to it that will make it a favorite in your home. It uses the thermoblock tech and also hides a water tank that is quite sizable at the back so that it never looks clattered. Which makes it easier and faster to brew with and also reduces scaling. Fast Heat Up & High Pressure Pump: The Essenza Mini delivers your coffee in commendable time, reaching the ideal temperature in less than 30 seconds. This is also the machine for coffee lovers who enjoy barista-style coffee. With a 19-bar pressure pump, the compact Essenza Mini extracts all the qualities from your coffee capsule that you want in your cup so that you have premium aroma, all the delicate flavors and most of all, a buttery crema for the professional cup of coffee. A Range of Coffee Recipes: Don’t be fooled by the Essenza Mini’s compact form; the unit delivers coffee in all the recipes you can think of. All you have to do is find a milk-based recipe of your choice and brew. This is one of features that are popular with a lot of users who like the idea of variety in the home rather than the coffee shop. Good for Everyday Use: The Essenza Mini is designed for the coffee drinker who often finds themselves having to prepare a cup in a hurry. Few buttons make it embarrassingly easy to use. In addition to this, you will also like how fast the Mini Espresso Machine gets your coffee ready. 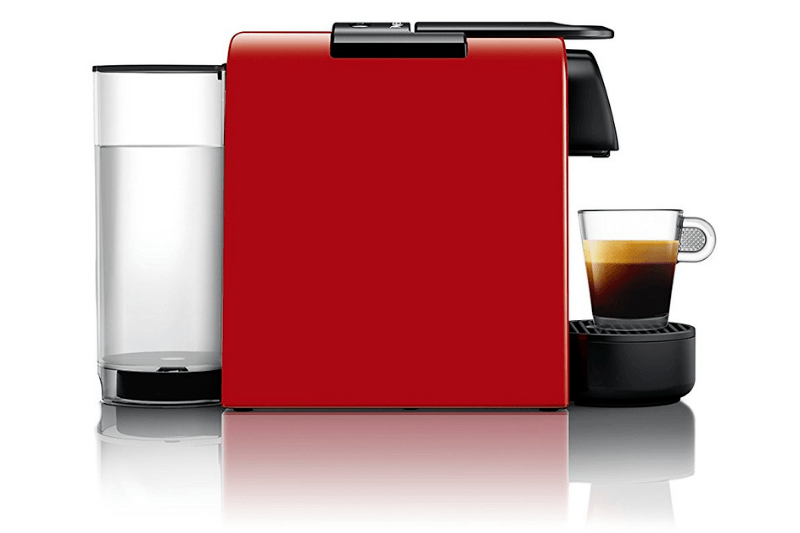 Performance: Like any other Nespresso machine, the Essenza Mini is packed with robust functionality. Think of the Pixie or Citiz and you have a rough idea of how well this unit works. The only difference is the fact that this unit takes up less real estate than either of the two on your kitchen counter. Features such as energy saving and automatic turn off are pretty cool to have too. 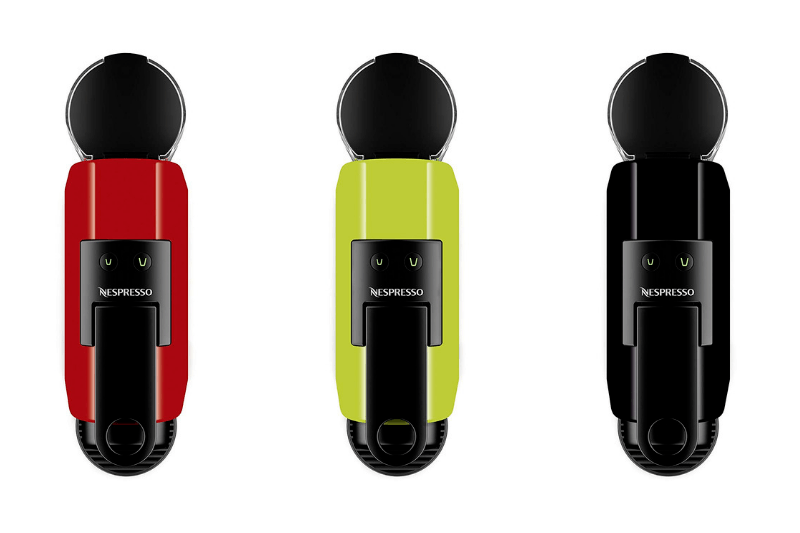 The Essenza Mini is a unit that is guaranteed to serve you well. However, there is always a thing or two that the manufacture gets wrong. In this case, there is not much that disappoints. Small Accessories are Choking Hazards: Due to its compact form, the unit has parts that could potentially be choking hazards if the kids find them lying around. Even so, the unit is meant to stay in an area of the kitchen that should be fairly difficult for the kids to reach. Parents of kids three years old and younger should watch out that these don’t land in the wrong hands all the same. Compatible Only with Nespresso Capsules: There are a lot of Nespresso addicts out there but even they would have liked a bit more choice here. The unit only takes Nespresso capsules and wittingly refuses to accept any other kind. However, with 24 Nespresso capsules to choose from it is one flaw you can live with. 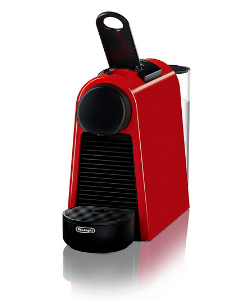 Going over the features and benefits of the Nespresso Essenza Mini Espresso Machine is an effective way to learn more about it. Now, let’s see what actual customers think about this product. We will explore some Independent review sites and customer reviews from Amazon. This can be beneficial for those browsing for their perfect coffee machine. This product comes highly rated on Amazon. It has a four-point-four star rating with over 222 customer reviews. I actually use this espresso maker every day. You can’t believe the quality of coffee that this tiny machine makes. I would personally like to recommend the chai latte, it tastes great and smells even better. It’s also very easy to keep clean you just have to keep cleaning the capsule area more often. Overall this machine is just great. I was brought this as a birthday present and I honestly like it. I didn’t think I would use it so often but now I use it on a daily basis. I like that you have a variety of capsules to choose from and it’s really easy to use, you probably won’t need the user manual to learn controls. Definitely recommend that you buy it. The Essenza Mini Original Espresso Machine is a practical appliance to have in the home if you like high quality coffee. The price is reasonable so you won’t have to worry about breaking the bank. We recommend that you buy it if you haven’t already, it won’t disappoint.